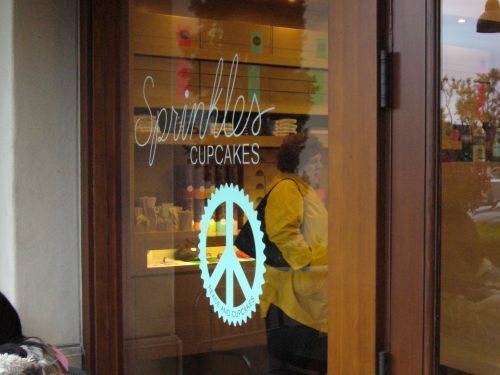 Here's that Sprinkles review I promised a few posts back. 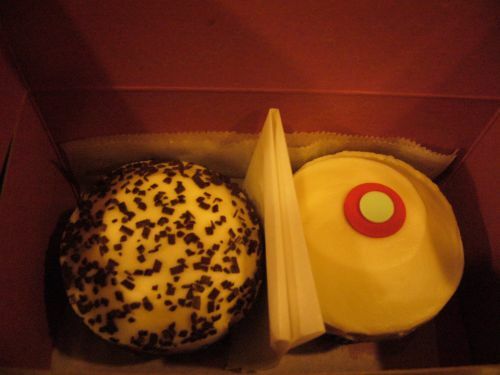 On a recent trip to visit my good friend NCT, I was pleasantly introduced to Sprinkles cupcakes at her home. GS brought home half a dozen cupcakes and one of them was a Red Velvet cupcake. Knowing how I just love Red Velvet cupcakes she graciously offered me one. 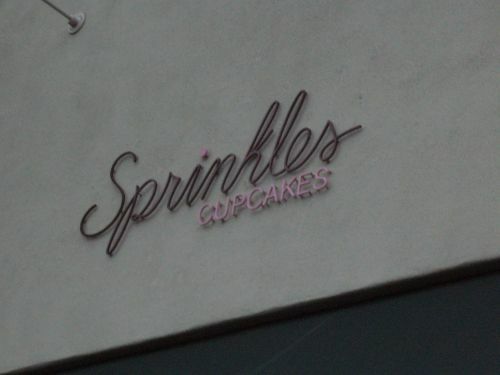 I don't care what LH has to say about Sprinkles... he believes that they put stabilizers in the cupcake. It was so incredibly moist and the frosting was just the right amount and sweetness. Unfortunately I thought the color was on the darker side of red... nearing the cocoa color. I've read some mixed reviews about this place since tasting it. I try not to be affected by harsh reviews most of whom dislike the chain aspect of the store. Honestly I have no issues with buying or eating from a chain restaurant. Did I mention my love for Animal Fries extra sauce on the side from In n' Out? I'm all for the small mom and pop stores since my parents have a small family run laundromat however if a chain sells something awesome I'm gonna have to buy it. Anyways, I was so in awe of this fantastic cupcake that I decided I must bring 2 back for the road to calm the cravings I know I'd be hit with once at home. Nhu-chi and I headed to the closest store which was in Newport Beach. The decore of the store was very cute, light and airy... definitely trendy. The prices of the cupcakes blew me away... $3.25/cupcake and you only get a discount of $3 when you buy a dozen for $36 after discount?!?!?! Ok ok, being a fan of Extraordinary Desserts I know Sprinkle's prices got nothing on Karen Krasne's creations but I do feel a little more justified for pay the latter prices with the fancy names(called torte instead of cake) and ingredients like gold leaf. 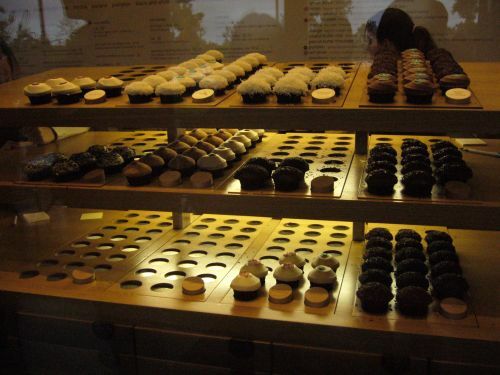 Then I thought about how scrumptious the first cupcake tasted and all my hesitations melted away. I got the Black and White- a Belgian dark chocolate cake with vanilla frosting and another Red Velvet- southern style light chocolate cake with cream cheese frosting. The Black and White was super moist but I wasn't digging the strong chocolate taste as I was hoping to taste some other flavors like the frosting! The Red Velvet was just as delicious as I had remember the first. I really like the light cocoa taste combined with the tang of the cream cheese frosting. Ok I'll have to admit that I did get another Red Velvet which I had intended on giving away but the first 2 I brought back were so good that I thought it'd be a crime to just give this one away too. My only complaint with Sprinkle's for packaging this one cupcake when I had intended to give it away was that they put it in waxed paper bag instead of a box like the other 2. I'm paying the same $3.25 for this cupcake like the first 2 so it'd be nice to get a single box for it without being asked to pay extra for boxing a single cupcake. 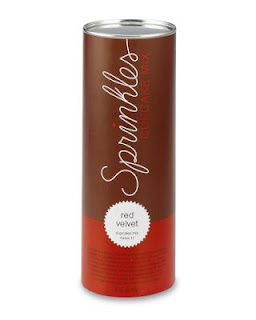 When I was browsing some of the gift items while waiting for my cupcakes to get packaged, I eyed their dry mix but decided against purchasing it. On the tube there is a recipe for their frosting that goes with the cupcake in the store. I liked the cream cheese frosting on the Red Velvet very much and searched for their recipe which appears on the tube. After some experimentation, I have to say that the recipe listed on the tube isn't the same as what they sell- the consistency and sweetness was very different. I can't blame them... if they were giving away the trade secrets than there'd be no reason for me to buy their cupcakes anymore. anyways, glad to hear that you're still happily eating away and hope that you will continue to do so for x amount of years to come without getting fantastically fat. thanks for the heads up on the blog change--i'll update your link soon. great post! I'm sure you can't wait for one to open in SD! Exercise is key! Haha... I actually don't exercise that much but I do control my portion sizes. Thanks for visiting! I'm actually not hoping that they open a boutique in SD. I think I'd go broke from visiting everyday.